It’s getting cooler at night. Sweaters and sweatshirts are making their way out of closets. Comfort food is a must when I have a day off to relax. That amazing feeling of snuggling under a blanket while watching a movie or enjoying a fire outside while eating a bowl of deliciousness. Deliciousness known as soup. Fresh veggies can be made into savory goodness to warm the soul. 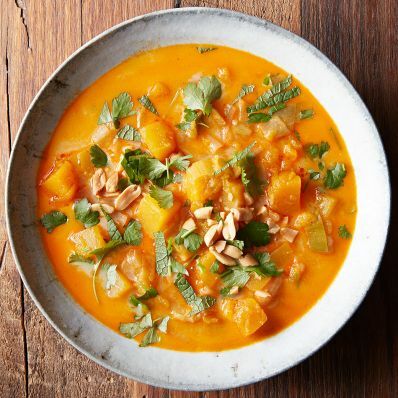 Butternut squash is one of those vegetables that is so versatile. It can be used in soups, roasted, made into “pasta” or “pizza”, and even roasted with cinnamon and honey for dessert. In my opinion, soups should be easy to make and take little effort in the shorter days of fall and winter. Here is an amazing recipe by NC native chef Vivian Howard. This recipe was recommended to me by one of my friends for good reason. Give it a try and it will not disappoint. 1 of 4 In a medium Dutch oven, heat oil over medium. Add leeks, ginger, garlic and 1/2 tsp salt and sweat for about 3 minutes. Stir in curry paste and cook 1 minute to develop flavor. 2 of 4 Add squash, broth and 1/2 tsp salt. Cover and bring to a gentle boil. Cook 20 minutes or until squash is tender. Check liquid level every now and again to make sure it’s not drying out. Add water or stock if needed. 3 of 4 Once squash is done, use the back of a spoon to break up about half the squash. You want this to end up chunky. Ideally, you’ll have some smooth squash along with some chunks. 4 of 4 Stir in coconut milk and lime juice. Taste and adjust salt and lime juice as needed. Serve very warm with cilantro, mint and peanuts sprinkled over the top.